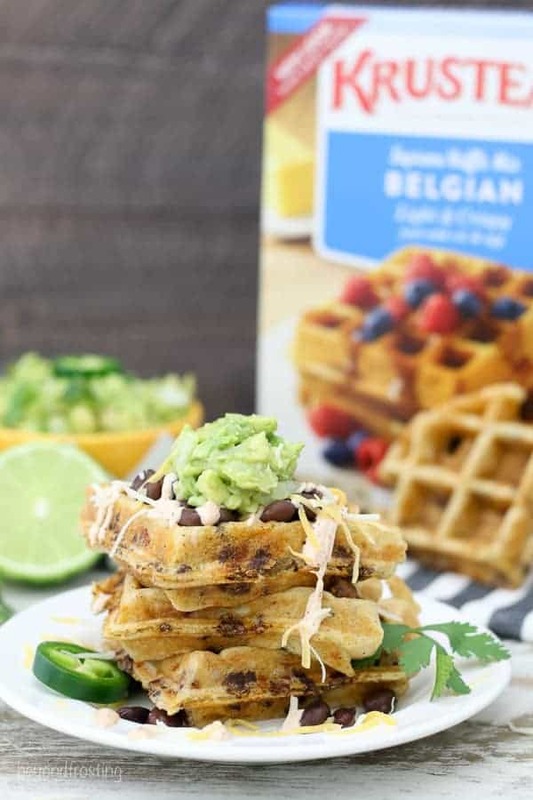 These Taco Stuffed Waffles are fluffy Belgian waffles are stuffed with spiced ground beef and cheese and topped with your favorite taco toppings! Savory waffles never looked so good! Breakfast for Dinner will always be one of my favorite dinners to eat. I am someone who can eat breakfast at all hours of the day or night. Sometimes when I don’t feel like making dinner, I just make an egg sandwich! I also love to grab some fried chicken from Chick Fila and then make a batch of waffles at home because there is no better companion for waffles than fried chicken and maple syrup. Are you a savory or sweet waffle fan? However, this time breakfast for dinner is getting a major upgrade. 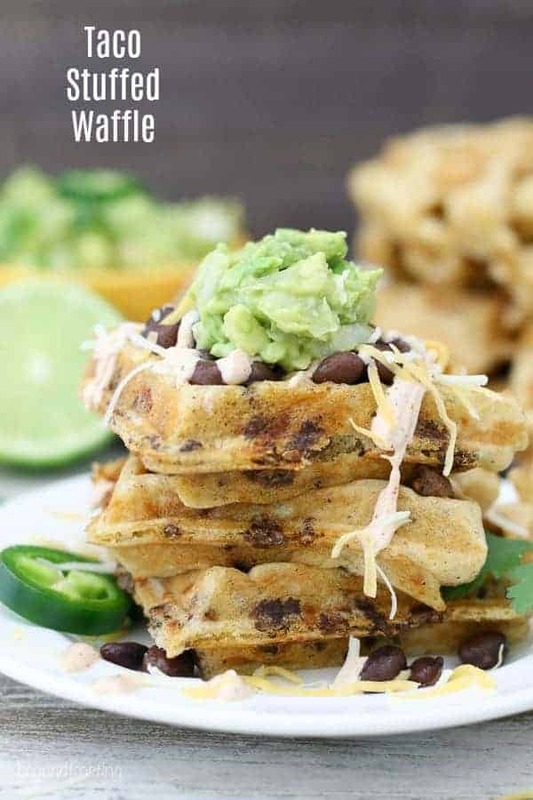 Let’s talk about these Taco Stuffed Waffles. 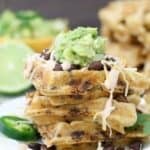 The most common meals in our house usually revolve around Mexican food, so it was a no-brainer when it came to marrying my love for Mexican Food with my love of breakfast for dinner. These fluffy Belgian waffles are stuffed with spiced ground beef and cheese. These waffles wouldn’t be completed without a little bit of toppings. Use your favorite taco toppings like salsa, guacamole and black beans. I also made a little chipotle crema sauce for the top, but that’s optional! For the waffle mix, I grabbed a box of my favorite Krusteaz Belgian Waffle Mix. 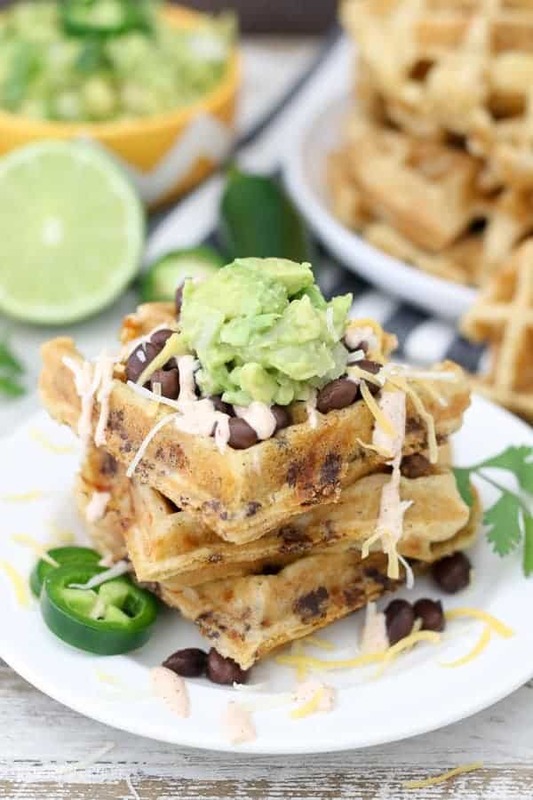 These waffles are light and fluffy but not overly sweet, making them the most ideal waffle mix for these Taco Stuffed Waffles. If you happen to be gluten-free, Krusteaz also makes a gluten-free pancake mix which may work as well. I always have a box of waffle mix in my pantry for when that craving hits! I love that you can also take this waffle mix and make it your own. I prefer the Belgian waffle mix myself just because it makes those nice, fluffy waffles with a hint of sweetness. There’re a couple steps involved. First, you need to brown the beef in a hot skillet. I grabbed a package of taco seasoning, but if you have a homemade seasoning you like, then go for it! I prefer to use a ground beef that is lean because there’s less grease to deal with. Once the ground beef had cooled a bit, I mixed it into the waffle mix. I also added a bit of lime zest to complement the ground beef. It’s best to wait until your meat has cooled to prepare your waffle mix so that it’s not sitting around waiting for you to finish. You’ll also want to be sure your waffle iron is properly preheated. I used ¾ cups of the mix for each waffle. You may need to use your spatula to spread it out a little bit. Each waffle cooks for 3-5 minutes depending on how much “stuff” you have packed into your waffle. These are also best served warm. I also prepared some toppings for my Taco Stuffed Waffles. You can see I added some black beans and guacamole. I also drizzled some chipotle crema on top. The crema is super easy. It’s just sour cream, chili powder, lime juice and salt. You might also want some extra cheese and maybe some salsa or chopped tomatoes on top. If spicy is your thing, you’ll certain want some jalapeños, too! 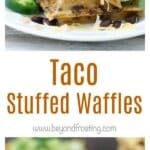 If you’re looking to switch up your dinner routine, you should definitely try these Taco Stuffed Waffles! 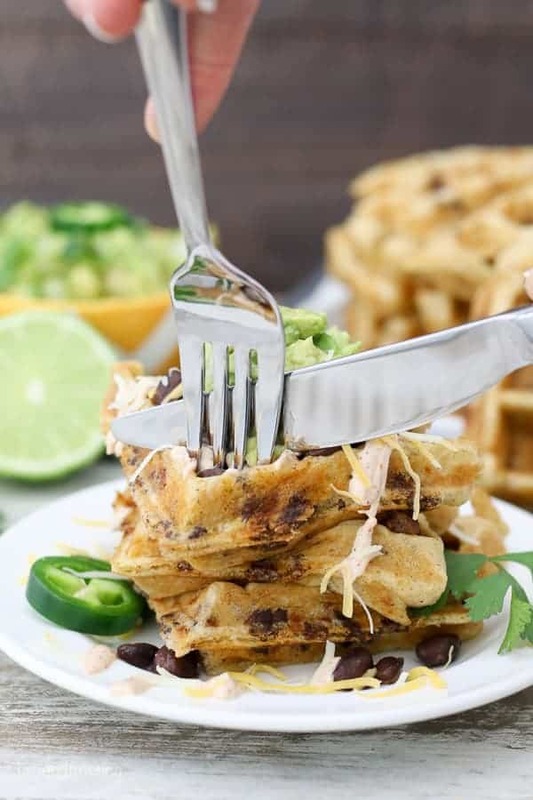 These savory Taco Stuffed Waffles are fluffy Belgian waffles are stuffed with spiced ground beef and cheese and topped with your favorite taco toppings! Sauté ground beef in a large skillet over medium-high heat until browned. Add taco seasoning and water and cook until the liquid is reduced. Allow the beef to cool. Preheat waffle iron.Whisk together the waffle mix, water, vegetable oil, eggs and lime zest until batter is smooth. Stir in the cooked ground beef and shredded cheese and stir until well combined. Spray waffle iron with cooking spray. Fill waffle iron with 3/4 cup of waffle batter and spread evenly. Cook the waffle 3-4 minutes until it is golden brown. Chipotle crema: in a small dish combine sour cream, chili powder, lime juice and salt. Stir until well combined and drizzle over hot waffle. Serve warm with toppings such as guacamole, sour cream and salsa.